The whole school are going to be leading their own learning to learn as much as they can about …FRACTIONS…! How much do you know about fractions? What pictures do you see what you think about fractions? How can you explain what you understand to others? 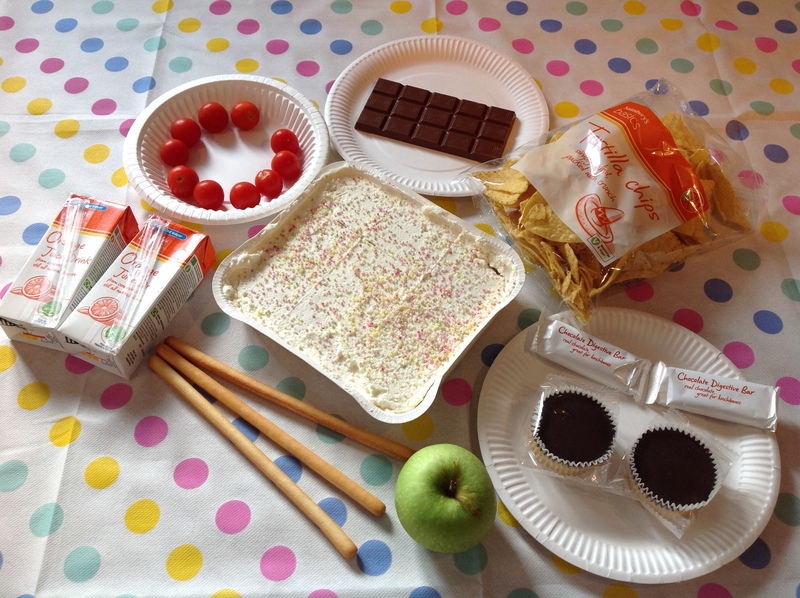 Have a look at the photo of our fair feast that was found at school this week. What would be easy to share with 2 people? What would take a lot of thinking to share between two people? What if there were more people to share with? What fraction of each food will you get? How much of each food will you get? The bread sticks i would chop them in 1/2 so you would get 3 each. yes i think you would . The juce is easy because you can just have one each . The apple is more tricky because one of us would get the stork and the other will not get the stork so it is not fare. I have just cut up my apple in half then half making quaters tats fare because we got 2 each and you can pull the stork of. Y ou would need 20 tomatoes to have 5 each . 2 people can have 5 tomatoes each because 5+5=10. You need to cut the apple in the middle so it is equal. Each person has half an apple. You need to have one whole breadstick each and break the other one in half. You get one drink each. I found different ways of cutting the cake in half. How could you make sure that each person gets exactly half a breadstick? You could measure the breadstick. If the breadstick is 20cm long you need to break it into 10 and 10. Then it is the same. I shared out ten counters. Each person got two whole tomatoes and half of one. To start with I thought it wasn’t fair but then I thought about cutting the tomatoes. I tried sharing the feast between 7 people. If you share 2 cartons of juice you get 2/7 each. If each carton has 250ml you have 500ml to share between 7 people. I did 500 divided by 7 using a number line. Each person gets 71 ml and 3/7. If you share the tomatoes you get one whole tomato and 3/7 of a tomato. This would be a bit difficult to cut up. If you share the chocolate you get 2 whole pieces and 1/7 of a piece. If you share the two cupcakes you get 2/7 of a cake. If you were sharing the feast in real life you would not share it out equally as sevenths are tricky. Sevenths do seem quite tricky! How many of each food would you need to make it easier to share equally? Think of your own ‘what if’ questions to lead other people’s learning. Would you rather have …? Have a think about your own what if questions for others to answer. The cakes would be easy because there is two cakes the same with the chocolate rolls and with the drinks. The chocolate bar you would have to exchang the piece into 4 half pieces . You have 10 tomatoes so you would get 5 tomatoes each. If there was 4 people and they wanted the tomatoes they would have to exchange the last tomatoe two times. You would have to cut the apple in half horasontaly for 2 people and for 4 people you would have to cut it in half 2 times horasontaly to get 2 pieces. I like your use of the word ‘horizontally’ to explain your thinking. I think it still might need a drawing to show your thinking a bit more clearly. 30 tomatoes for each child to have 5 . In our class we have been answering different what if questions now I have got one for you. What if…….there were three breadsticks and 12 hungry people. what if 12 peopel came. what if 13 peopel came. what if 14 peopel came. Good what if questions. I wonder how many people will reply to your thinking? Try to get others in school to answer it so you can reply to them. Do you think it is easier to share the feast between an even amount or an odd amount of people? Great What if questions Harry! If you had 10 people each person would get 1 tomatoe each. Good thinking. What if there were 20, 30 or 40 people? Do you notice a pattern? If there 20 people there would be half a tomatoe each. The pattern is the more people to share with is less tomatoes for the people. Is there a pattern between the number of people and the fraction of tomatoes they would get? What if 66 people came? What if 798 people came? What if 333 people came? What if 75317 people came? What if 4321567 people came? So what if 1 apple was shared between 798 people? What fraction of the apple would each person get? What if you had 1 cake. What if i did not share them out proply. We (my class) have been answering different what ifs we created at the beginning of the week. We investigated different amounts of foods, people and different lengths and sizes of food. I worked about what if their were 5 people to share the feeast between then we found what if you shared between 7 people and then i throught this is going to be hard. Lauren here. I worked out how much food there would be if 2 friends ate it and another friend came. It’s a what if question. What if you ate 3/4 of the food. What fraction of the food is left? I think that you made a great explanation. But what if she ate 1/2of her oranges and apples? What would she have left? 2 divided by 3 equals 2/3. I think that the crisps would be the hardest because there are lots of different sizes it wouldn’t be equal if I had a big crisp and my brother had a small. You would get the grams and half it twice which makes 150g. Mr Ellis what if you shared the food out eqully and everybody had ate 1/2 of their portion and then one other person comes along? It’s so great to see so many of our class blogging; well done Abbie, C.Brooke, Keeley and Harry! Super thoughts so far. I am wondering if you can explain to the other children what exchanging is? Can you give them an example to help them to understand? Good thinking. How would you make sure everyone gets an equal amount? For example think about if there were two 200ml cartons of juice to share between 5. Yes I think it would be very esey I.
I’m really pleased to hear that you have been learning lots and you are up for a challenge. The more you challenge yourself, the more you learn. Who do you think is best at leading your learning? Mrs Fallows I got the fair feast and it was so so fun. And what fraction of the 150 goodies would each person get? Can you make this fraction any simpler? what is the theem of next week . What would you like the theme of next week to be? I really enjoyed fraction week because if I got stuck others helped me so I would return the favour!! !